Research In Motion (RIM) hinted on the development of Blackberry OS 6.0, the upcoming OS that will power existing and new BlackBerry smartphones. The present version, Blackberry OS 5.0 was released at the end of last year, and is now available for Blackberry Storm, Storm 2, Bold and other smartphones. The new Blackberry operating system will offer a combination of social media, multimedia and business productivity features. RIM hasn’t provided any details of phones that will get BlackBerry 6.0 upgrade or the dates around which final version would be available for download. RIM has posted a video showing the features of Blackberry OS 6.0. The OS will bring a redesigned user interface and home screen to all compatible Blackberry phones. At first look it all looks the same, but it has numerous enhancements that help users to access the device features in ease. For instance, there is a universal search for device wide search in contacts, favorites, apps, media, calendar, etc. 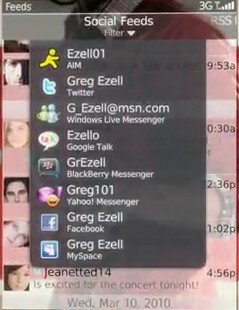 The home screen of the Blackberry OS 6.0 provide more customization options than any other existing versions. Users can create up to 6 page tabs with their favorites, apps, media shortcuts and fast flip through them using touch. The interface of Blackberry OS 6.0 is more responsive to figure gestures. Improved kinetic scrolling and system wide multi-touch support is another plus point of the new OS. 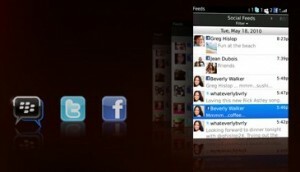 BlackBerry OS 6.0 gives more importance to social media connectivity. The social feed application gives quick access to Twitter, Facebook and Blackberry Messenger, and other updates of favorite contacts. Blackberry OS 6.0 implements a new pop up way to access options in touch enabled smartphones. A pop up window with several options will appear when user taps on any contact, application or media files. This way they can call, send, SMS and use other specific operations of applications very easy. The BlackBerry OS 6.0 will include one click access to media files, a new music player with album arts, fast flip transitions, etc. Photo browser includes improved thumbnail effects with multi-touch and pinch to zoom. Another great attraction of BlackBerry OS 6.0 is the addition of an improved browser based on the web-kit engine. The browser has a better visual design, multi-touch support, tabbed browsing and improved security features. Altogether the new OS is upgrade would make the Blackberry’s in stand with latest smartphone operating systems. A final build of Blackberry OS 6.0 will be available for download by Q3 of 2010. Just connect your Blackberry phone to apploader and download the update. Update: RIM officially announced the features of Blackberry OS 6.0. Social feeds: The BlackBerry OS 6.0 comes with great social media connectivity features. Subscribed RSS feeds and social media updates from Twitter, Facebook and BBM will be arranged together in social feeds application. Moreover, any update made on social feeds app will be posted all selected social networks. New home screen: The redesigned home screen lets you to access all apps and favorites by touch scrolling. Improved BlackBerry Messenger, gallery application,camera modes and media sync over Wi-Fi. A new universal search application at the home screen- for searching through contacts, gallery, application, messages and web pages. 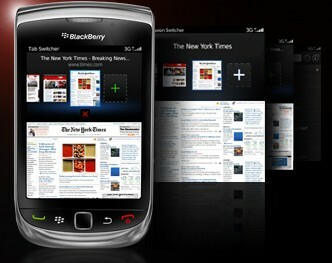 The most attractive feature of the BlackBerry OS 6.0 is the new web-kit based browser. It is faster and supports tabbed browsing. The first device to get BlackBerry OS 6.0 update is the BlackBerry Torch announced on 03-07-2010. Other devices on the update list include BlackBerry Bold 9700, Bold 9650, Pearl 3G, and future BB smartphones. Why is the OS 6.0 not available for the BB Storm 2? This phone basically got screwed because it only came out about a year ago and it looks like it wont get any of the upgrades with the Droids coming out because people are choosing those over the BB. Well, for those of us who cant upgrade for like another year and are stuck with the BB we would at least like some of the new cool features!! pls how can i download blackberry storm 2 O.S? Is the 0.S 6 available for BB 8520 Curve? if yes, please send the link. Also inform if there are some technical constraints !!! 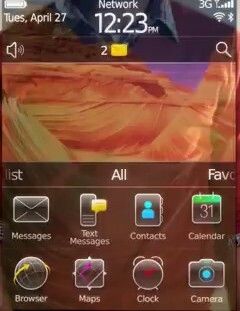 Does anyone have the link for bb 8520 os 6? Thanks in advance! i don’t have comment exactly but i think i have a question, why don’t you put also this BB OS 6.0 for blackberry bold 9000 and tour 9630? where the link to download os 6 for strom2??? @Kyomoon Os 6 ain’t available for Storms. Could you please send me the OS 6 (download link) for BB 9300? For those of you who cannot wait that long a Blackberry OS 6.0 theme has been created called “I Dream of 6″. It is completely OS 6.0 inspired and the theme features fully customizable dock icons, wallpaper friendly, animated menus, custom icons and the developer has promised free upgrade when new icons and features are added. I wish Blackberry OS 6.0 software who can send me the link? Hello , is there software 6 for blackberry 8520? I want BlackBerry OS 6.0 link please provide.